Last month, Governor Scott Walker directed state agencies to prepare their 2015-17 biennial budget requests, and the Board of Regents approved UW System’s budget proposal last week. The proposal includes $95.2 million for the “Talent Development Initiative,” the implementation of new performance measures, and statutory language changes related to compensation, including the ability to offer merit pay increases. $30 million for a competitive grant program targeting six areas critical to the state’s economy: agriculture, finance, insurance/real estate, healthcare, manufacturing, transportation, and water research. $27.3 to cover a pay plan funding gap. Historically, UW System funds about 30 percent of a pay plan increase with tuition dollars. The two-year tuition freeze has led to a funding gap, with many campuses holding insufficient reserves to cover the pay plan. $24.4 million to increase the number of college graduates statewide, with much of the funding directed to the Course Options program, a program that allows high school students to earn college credits. Additional funding would expand the Flex Option degree program, improve the credit transfer system, and assist working and first-generation college students. $22.5 million in one-time funding to assist with the creation of STEM (science, technology, engineering, and math) jobs. The money will be available to individual campuses through a competitive grant process. The budget process is lengthy, beginning with formal introduction in January and final passage in late June. PROFS will be involved throughout the entire process and communicate regularly with faculty. Last spring, Governor Walker announced an additional two-year freeze on University of Wisconsin System tuition. The governor said his proposal was a direct result of the disclosure that UW System would finish 2013-14 fiscal year with almost $1 billion in reserve. The governor first called for a tuition freeze after UW System was found to have just over $1 billion in reserve. Governor Scott Walker faces challenger Mary Burke, former Secretary of Commerce and Madison School Board member. Earlier this week, former UW-Madison professor Charles Franklin released a new poll showing the race continues to be a toss-up. The legislature will experience its largest turnover since the 1970’s. Six state senators and 21 members of the assembly announced their retirement earlier this year. The fall primary was held earlier this month, and the outcome of one primary — the 17th Senate District — is still unclear. Governor Walker and Attorney General J.B. Van Hollen recently asked a federal court to reinstate the voter identification law that was passed two years ago, but never enforced as a result of several state and federal court challenges. 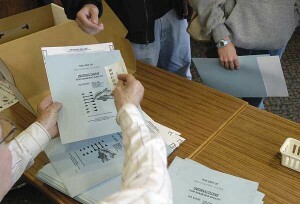 Many legal experts believe the current federal challenge will keep the law on hold through the fall elections. PROFS lobbied against voter ID legislation. 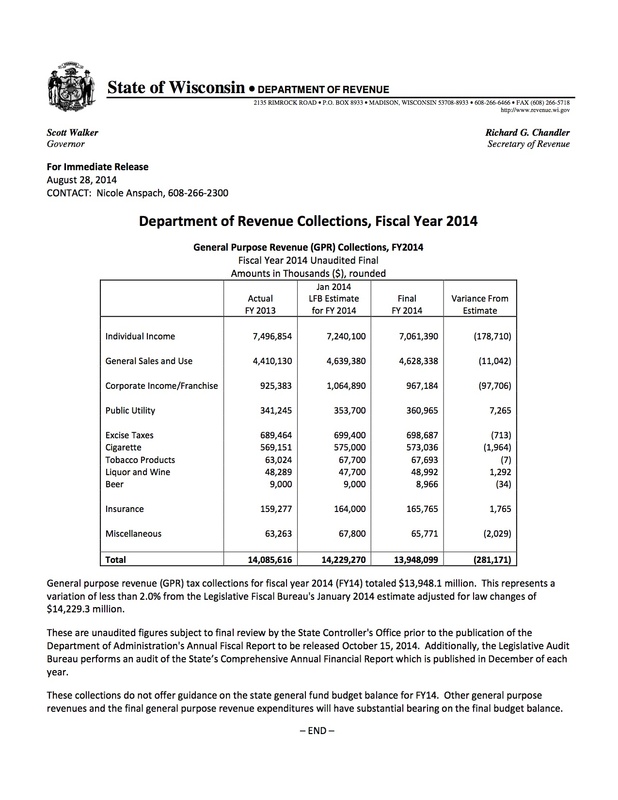 The Department of Revenue announced today that General Purpose Revenue (GPR) collections for fiscal year 2014 are $281 million less than projected. All tax categories were lower than projected except for public utility; liquor and wine; and insurance. The shortfall means the state faces a $115 million deficit at the start of fiscal year 2015-16, and all but guarantees that the state budget process will be more difficult than expected. The University of Wisconsin System Board of Regents is meeting at UW-Oshkosh today and tomorrow, August 21 and 22. Livestream coverage of the full board meeting is here. Regents committees will meet Thursday morning, while the full board will meet Thursday afternoon and Friday. The board will consider UW System’s state budget request Thursday afternoon. The proposal includes $95.2 million for the “Talent Development Initiative,” the implementation of new performance measures, and statutory language changes related to compensation, including the ability to offer merit pay increases. The budget request notes that Governor Scott Walker directed state agencies, including UW System, to submit proposals that assumed no new funding, but UW System discussed its intention to request an budget increase with members of Governor Walker’s staff. To meet or exceed the current plan to improve the six-year graduation rate. Wisconsin’s partisan primary election will be held tomorrow, Tuesday, August 12. Polls are open statewide from 7 am to 8 pm. Information on voting and how to locate polling places is here. Photo identification is not required to cast a ballot. Two Democrats are vying to represent Assembly District 78: Alders Mark Clear and Lisa Subeck. The winner will be unopposed in the November general election and will almost certainly be elected. PROFS hosted a forum with both candidates last month. Two Democrats are on the ballot in the 17th Senate District, the seat left open after Dale Schultz, a moderate Republican, announced his retirement. Voters will choose between Ernie Wittwer, a retired administrator with the Wisconsin Department of Transportation, and attorney and former legislative aide Pat Bomhack. The winner faces State Representative Howard Marklein in November. Tomorrow’s election will also determine the Republican candidate for Wisconsin’s 6th Congressional District. Congressman Tom Petri announced his retirement in April. Four Republicans are on the ballot tomorrow, including State Senators Glenn Grothman and Joe Leibham, Representative Duey Stroebel, and technical college instructor Tom Denow. The winner faces Democrat Mark Harris, Winnebago County Executive.